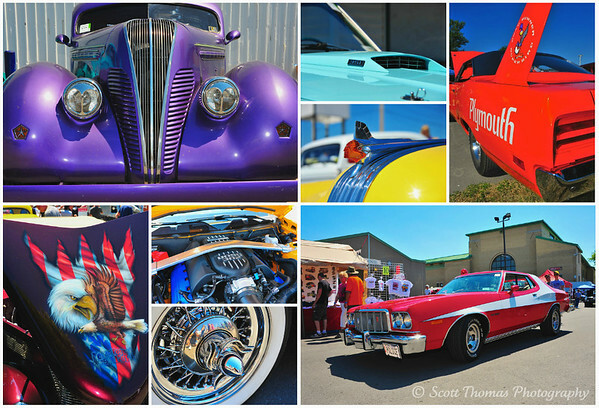 Last weekend I photographed the 12th annual Syracuse Nationals car show. This year the show had over 7,000 entries from antique automobiles to totally custom creations. Photographing a show of this size is very challenging and overwhelming. Being a mostly outdoor show, the weather can play a big factor. This year there was bright sunshine and temperatures hovering around 90 degrees F (32 Celsius). 2011 Syracuse Nationals car show at the New York State Fairground near Syracuse, New York. Like any subject, I find I like the photographs of cars and other vehicles better if I get down to their level. When approaching a car I would like to photograph, I walk all the way around it (if possible) looking for distinguishing characteristics. I ask myself what makes this car unique from the thousands of other cars at the show. It could be the shape of the car (the Plymouth Superbird in the upper right corner with it’s large rear spoiler), special paint color or graphics (the patriotic painting on a hood in the lower left), special place in pop culture (the red Ford Gran Torino replica from the Starsky & Hutch TV show in the lower right) or a part of a car like a hood ornament, wheel or engine (the four smaller photos). The upper left car is one of my favorite kinds of hot rods, a 1940’s Coupe and another good reason to photograph a car at a show. The bright sunshine I mentioned created dark shadows and I used a Nikon SB-600 Speedlight flash for fill light. Show cars are very shiny and reflective. Care must be taken by the photographer to not be reflected in the photos. Of course, sometimes it’s fun to do so. Vendors selling iced bottled water and drinks got a lot of business from me as I made sure I kept plenty of fluids inside of me. There were reports of heat related illnesses and I did not want to be one of them. This entry was posted in Event, Photography and tagged cars, fairgrounds, flash, ford, live show, nationals, new york, nikon, plymouth, sb-600, speedlight, starsky and hutch, superbird, syracuse. Bookmark the permalink. I find the most difficult thing about photographing cars in a car show is all the people in the way!! Very frustrating, especially when they can SEE that you’re trying to take a picture, and they can’t give you two seconds to do it. nice – very colorful! I too love to photograph cars. Welcome, Sheila, and thank you. Your have a nice collection of photos on your blog. Wow. These are great “old-timers”! I understand very well the problem of photographing so huge amount of cars. Happily we have only few hundred in our car shows, so it is easy to select some of most interesting of them. I love the violet car in left upper corner. Thank You presenting some of them. This is the biggest show in the northeast and I have photographed it a few times. Gets easier each time. As I mentioned, the coupes are my favorites. Nice selection Scott! I think the temps in the 90’s would have lost me though. Terry, are you being spared the heat wave this week? My daughter in North Dakota had triple digit temps over the weekend. Those mountains must by protecting you. I will be in more 90 degree heat this weekend. Should be back into the low 80’s next week. Fortunately we have not shared that heat wave, in fact it has been quite cool for the last several days. Our normal highs this time of year are around 80 and we’ve been having highs in the 70’s. The forecast is for a couple 90 degree days, then back to normal again next week. The mountains around where I live do create much of their own weather. I got myself in a few reflections. Hard not to but you just have to be aware of it. Try different angles. Crowds are something you have to deal with. Getting in close for detail shots helps eliminate them. Or add them. The shot is small but the chrome wheel in the collage has a crowd reflection. A fantastic mosaic of cars of all styles and colours ! Thanks for sharing your visit with us and giving such great advices too. I like the details you chose to present in a particular car. I would have loved to see the exhibition…on a cooler day. I bet you’d see some very cool automobiles in an European exhibition, Isa. There were a few European cars at this show. Would love to have seen more. Barry would have enjoyed this, too. He is thinking of putting his old Studebaker pickup truck (1949) piled with wood in a local show. He thinks that would be a hoot! He should. It would be a huge hit with the UP crowd. Great shots and tips Scott. I’ve never photograph car show before, I know we have some interesting ones in our area. They are fun. I want to concentrate on the people more next time. Owners and admirers are fun to watch at these shows. I would not think twice about going A little hot for me, but the Starsky and Hutch car…awesome. Great idea bringing the flash, a lot of people don’t think of it on sunny days. Thanks, Mike. I was a big fan of Starsky and Hutch when it was on TV. Probably more for the car than the stories. 🙂 Yes, I put my flash on whenever I will be out shooting in bright sunlight. I get a lot of looks but not when they see the results. I often help people with P&S cameras find their Sun portrait setting which will use their flash. They get so excited when they see how it works. Of course, then I have to warn them to change their settings. Opening that door to better photography means having to remember more. You are right, the owners and fans of the muscle cars and antiques are really interesting. Next year at the Woodward Cruise I might just concentrate on them, given I took a few hundred shots of the cars themselves this year! 🙂 Loved your group of photos here and your advice, some of which I remembered last weekend while I was out.